Visit the Photo Gallery for pictures of our previous launches, including some great views of the Earth from near-space! This was the first launch in which the UCSD near-space balloon team launched two balloons at the same time. 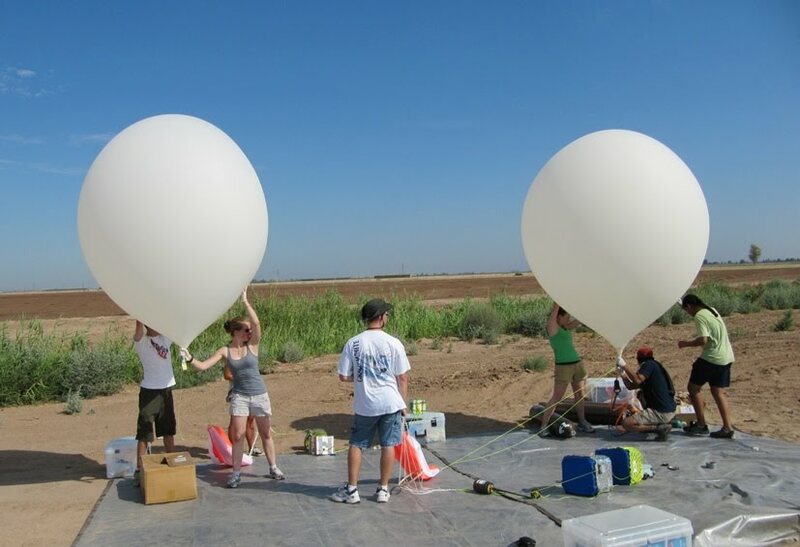 One balloon was a large (1500 gram) balloon carrying some climate-change related experiments and a sophisticated camera system, and used the StratoStar tracking system. The other balloon was smaller (1000 gram), and built to test low-cost options for performing balloon launches. It carried several different low-cost tracking systems in order to evaluate the reliability of each system. The team decided to launch several experiments which would be relevant to climate change discussions in high school classrooms, with the intention of passing on the data to local high school teachers for supplementing their science curriculum. In addition to the climate change specific experiments, the standard atmospheric sensors (pressure, temperature) were also flown. Two primary experiments were prepared and flown for climate change discussion: a Vernier gas sensing suite, and an air particle counter. Vernier system with gas sensors: This Vernier system is a handheld data acquisition device with an intuitive interface and a variety of plug-and-play sensors available. The UCSD balloon team has used this on several flights , and with several different sensors. For this flight, the team added oxygen and carbon dioxide sensors to the unit. Air particle counter: An air particle counter, flown on a previous MAE2 balloon flight, was placed into an updated payload box and re-flown. The first time the device was flown, results had been limited due to failure to record throughout the flight. Also, the air entering the device was not heated during the first flight. The updated payload box which contained the device for the second flight was designed to warm the air entering the machine by forcing the air around several chemical heaters. Outside air entered the air particle counter through ducts cut into the payload box, and was expelled after analysis. Small particles (fine dust, smog, smoke) and large particles (large bacteria, pollen, spores) were counted and displayed as particle count per .01 cubic feet of air. packs (left side),video camera for data recording (bottom), and chemical hand heater system (exposed at top). Taking pictures from the edge of space is always exciting, and the images are often used to inspire and motivate students. The images can also be used to approximate balloon position if the ground is visible, and in some cases they may be the only evidence that a balloon reached near-space altitude (for example, if tracking systems or pressure sensors failed to indicate altitude.) The UCSD near-space team designed and built a camera pod with the intention of taking a 360° panoramic shot from the edge of space. 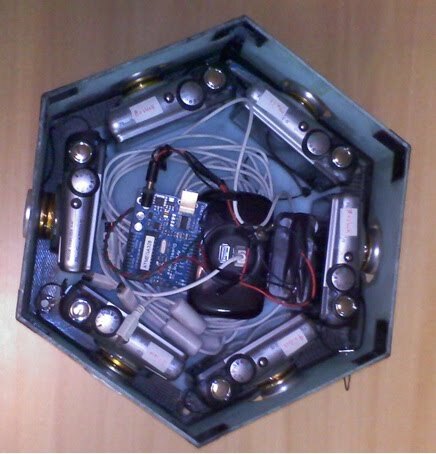 The system was designed around six Canon cameras, and used an arduino microcontroller to synchronize the shutters. The synchronized cameras took a picture automatically every 15 seconds. The Canon CHDK programming capability was also utilized. The large balloon was tracked during flight by primarily using ground antennae to pick up the balloon's StratoStar 900 MHz transmission. A backup HAM radio module was also onboard and transmitting GPS coordinates, and a SPOT GPS messenger was the third tracking option onboard the balloon. Weather-based trajectory simulations were run several times prior to launch, and used to select the launch location which would maximize the chances the balloon would land in a desirable location. (For us, the best landing zone is a cluster of farm fields just south of the Salton Sea.) The simulations were run using the near space ventures online flight track prediction software. location is selected to improve chances of landing in a desirable landing zone: in our case, the farms south of the Salton Sea. 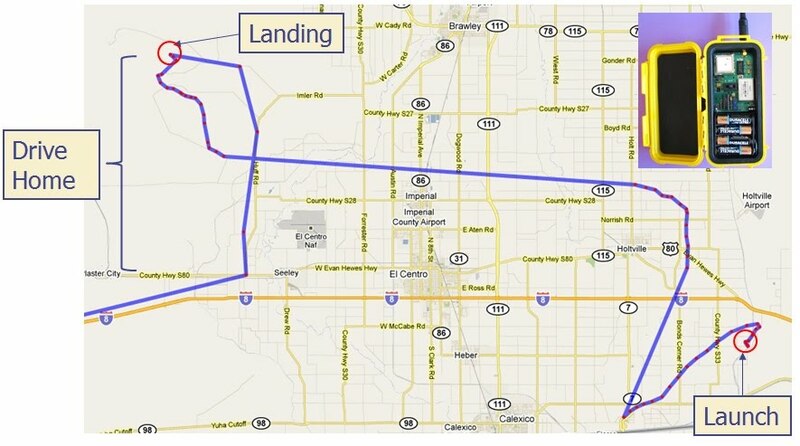 The signal from the balloon's primary tracking system was lost during part of the flight. It is believed that this was due to an incorrect orientation of the long-range ground antenna: the antenna must be pointing in the direction of the balloon in order to receive signals when the balloon is at altitude. When the orientation was corrected towards the end of the flight, the signal was picked up by the long range antenna. It is estimated that the balloon reached at apex of at least 90000 feet when it burst. extrapolation was used to estimate the burst altitude. 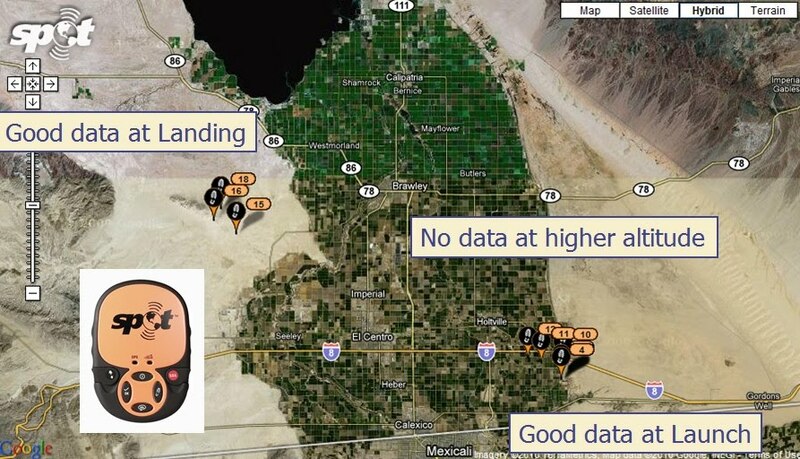 The balloon landed in the west portion of the Salton Sea farming region, near the edge of the predicted landing zone. This made recovery simple: just get out of the car, walk out on the field, and pick up the balloon! When the balloon was found, the payload chain was neatly lined up on the ground: a beautiful landing! spotting the balloon on the ground easier. 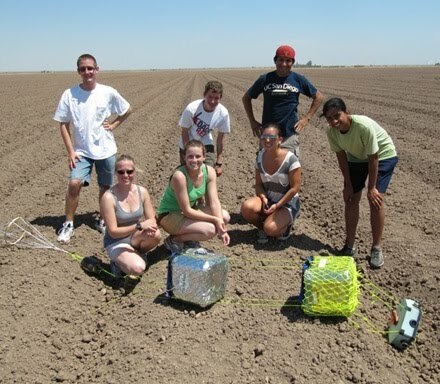 The team with the balloon, before moving any of the components. Vernier system with gas sensors: The Vernier system functioned during the entire flight and successfully recorded data from the gas sensors. However, analysis of the data indicated that the sensors themselves malfunctioned. Discussion with representatives from Vernier led to the conclusion that the sensors were unable to operate in the extreme cold experienced during the balloon flight. A new experiment is being designed to attempt to measure gas concentrations on the next balloon flight, using a more cold-tolerant sensor. Air particle counter: The air particle counter's data was recorded by a small video camera pointing at the air particle counter's display. Due to delays during takeoff, the video camera memory ran out early in the flight, causing an incomplete flight profile. However, the data that was retrieved followed the hypothesis: particle count was highest near the surface, and both large and small particle count decreased with increase in altitude. Large particle count decreased more rapidly than small particle count. A different method of data acquisition is being tested to circumvent problems associated with the video camera on the next air particle counter flight. Camera pod: With six cameras automatically taking a picture every 15 seconds for an hour and a half flight, the team was faced with the imposing task of sorting through a huge volume of pictures and stitching them together. To streamline this task, the process was semi-automated using a combination of custom-made code and commercial picture stitching software. Some of the cameras failed to take pictures during the entire flight, and there were also some errors in the synchronization system which caused some shots to be out of sync. However, the synchronized images that were obtained led to some exciting panoramic shots. Additional work on the camera pod to fix these issues is underway, with intentions to fly the pod again. 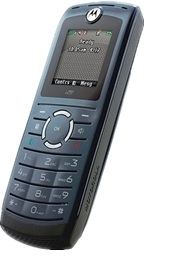 Motorola i290 cell phone: One of the cheapest options for tracking a near-space balloon is to program a cell phone to function as a tracking device. The Motorola i290 was flown, with the cell phone programmed to automatically report its GPS position to a website when it was withing range of a cell phone tower. Although limited to areas where there is adequate cell phone coverage, the low-cost and lightweight aspects of this system make it a very attractive tracking option. However, programming knowledge is required. The phone cost $50 to purchase, and $10 to activate. It then cost $1.35 to purchase minutes for a day of use. 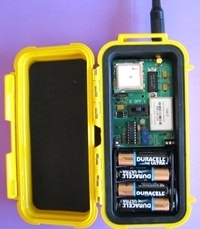 Byonics Micro-Trak AIO: This device uses HAM radio signals to communicate its GPS position. One of our team members has a HAM radio license, and programmed his call sign into the unit prior to launch. Once programmed, the unit is very easy to operate and transmits its GPS position using the popular HAM radio APRS. Accessing the APRS information requires either a handheld HAM radio receiver or access to an APRS website (we use Google APRS.) At $260, this is more expensive than the cell phone, but it is also more 'plug-and-play'. A SunSPOT microcontroller equipped with several sensors was placed onboard the balloon to record flight conditions. This system monitored pressure, temperature, humidity, acceleration and magnetometer tilt. SunSPOTS were used on previous UCSD flights, and have proven to be effective and versatile devices well-suited for near-space ballooning: they are small, lightweight, accept lithium batteries, and are compatible with a large variety of sensors. The low-cost balloon structure was simple: all components were tied to a common string, and styrofoam boxes were then hung around the devices to provide environmental protection. All of the components were hung underneath the parachute, and the balloon was tied to the top of the parachute. A simple radar reflector (built from cardboard and reflective foil) was also hung in the payload chain. The balloon was launched without difficulty, and tracked during flight using smart phone to access the APRS, SPOT, and cell phone data. Cell phone signals were weak in the launch area, limiting the amount of information the team could access during the balloon's flight. The balloon landed in a desolate area just west of the predicted landing zone, and was intact upon recovery. Left: the low-cost balloon as spotted upon recovery. Right: the recovery team with the balloon. Tracking Systems: The motorola i290 functioned well at the launch and landing locations, but did not record position during the rest of the flight. However, the results are promising, and the team plans to test the phone again after making some changes to the code. The Byonics Micro-Trak provided a reliable tracking solution, functioning well at the launch and landing locations. GPS position data was not obtained past 60000 feet, but this is due to an ITAR regulation which requires manufacturers of GPS-enabled devices to prohibit the device from providing position data over 60000 feet (unless the device is moving at speeds less than 1000 knots). Most manufacturers satisfy this requirement by designing their devices to stop working over 60000 feet regardless of the device's current speed. to report position data during the return trip to San Diego. 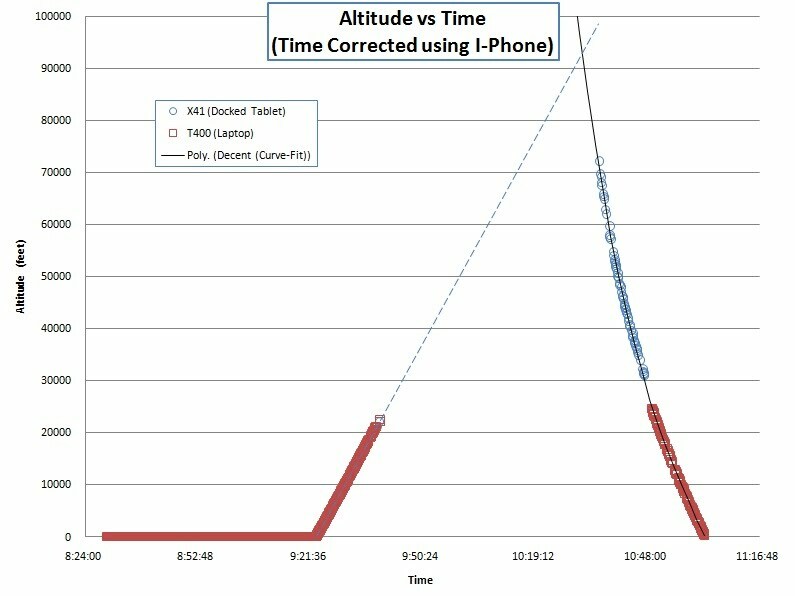 The altitude versus time plot from the Byonics Micro-Trak data is shown below. The signal was briefly lost during ascent, and the device did not provide position data over 60000 feet as previously noted. However, a linear approximation was used to estimate the balloon's burst altitude, as shown on the second altitude versus time plot. This resulted in an estimated burst altitude of 85000 feet. 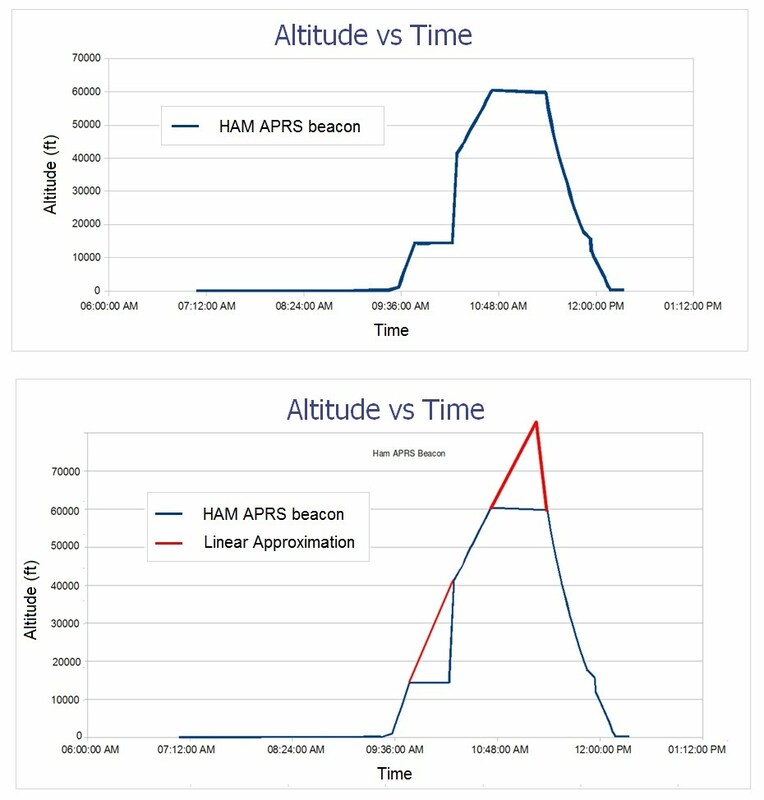 Altitude versus time plots from the Byonics Micro-Trak. Top plot is data only, bottom plot includes linear approximation to approximate entire flight profile. The SPOT GPS Messenger provided several position reports at the launch site, and at the landing site. It does not provide any position reports at higher altitudes. However, the SPOT functioned as it was intended: it provided the position of the balloon at landing. The SPOT GPS position reports. The SPOT provides a position report every ten minutes (using the 'track progress' option).